Payroll is one of the most crucial and time-consuming tasks for any small business owner. 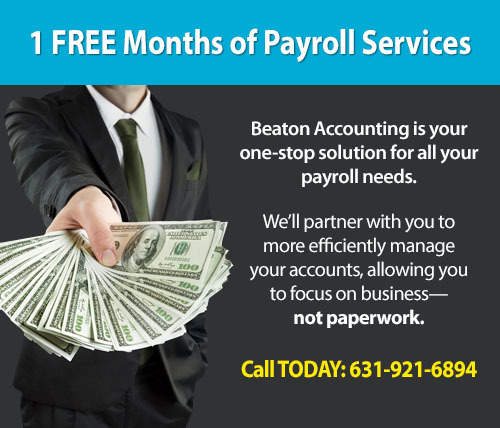 Beaton Accounting, your preferred payroll provider of Long Island, provides all the services you need to ensure your employees stay happy and your company stays in compliance. No worries when filing these forms. We take STRESS out of your business. Sign up now and receive 50% off your first 2 months of payroll service! Savings are dependent upon the number of employees, but you could save up to $500! Check out this video to learn more about our payroll services.